My inside forward on the left, so in the AML position, won't cut inside because it conflicts with his PPM of "Runs with ball down the right". Should I report this as a bug or am I misunderstanding something? Runs with ball down the right kicks in when he's on the right wing, so nothing to do with cutting inside from the left. I don't think I've ever seen an Inside Forward who doesn't cut inside, can you upload a match pkm which demonstrates this? Does criticising/praising someones training performance have any impact on their future behaviour? Because i see the same offenders training poorly most weeks, and then I tell them off, but they just acknowledge it. In FM19 If I use a player in the DM-C strata will the defensive line drop slightly deeper as in previous versions? Are there any other guides on how I can implement other roles such as Raumdeutur/Trequartista. I have never seemed to get mezzela or carrillero into a tactic either. any help would be appreciated guys, getting bored of using the same tactic! Welcome to the forum . There are plenty of threads which show people using any number of different roles. Anything by Cleon or Rashidi are usually a good start. I have a current thread going at the moment (Developing my 4123DM tiki taka) which uses a Treq out on the wing. There are also guides linked in the "Please Read" thread pinned to the top of the forum. Note however these guides and threads tend to focus on the complete picture of putting together a decent system, rather than just "this is how to use a Raumdeuter" for example. Maybe inverted winger? Though he also cuts inside with the ball, which you (for some reason) don't want. But you need to post a screenshot of your tactic or - ideally - to start a separate thread with a lot more details, so that we could get the whole picture. 1.Are attributes like team work, stamina not taking CA points? What about others non hidden that you are sure that are not taking CA? 2.Is the player able to reach better mental attributes due to experience even if he reach PA? or at least some of them ? 1. There are very few visible attributes which are not taken into account for the CA calculation. Determination, Aggression and Bravery I think are the only 3. None of the hidden attributes are included. All other attributes along with footedness and positional familiarity are included. 2. Once CA reaches PA attributes can still change. In this situation some attributes must decline in order for other attributes to increase. So yes, Mental attributes can become better if PA has been reached, but something else must reduce in order for that to happen (assuming those attributes are included in the CA calculation). 1. Is there a way to increase Bravery ? Bravery can already increase. Over time, with experience and as training progresses. Did u thought about making for example team work without taking CA so everyone with time could increase it ? Everyone can already increase Team Work with time. Some roles are likely to develop it more than others but it can still increase over time regardless. It can increase over time, it isn't locked. As I said above, even if somebody has reached their maximum CA their attributes can still change - it just means some attributes have to reduce to allow others to increase. If that didn't happen, everyone would be able to increase their attributes exponentially. If you have suggestions of where you think the game could improve, detail them in the Feature Requests Forum. Bravery can already increase﻿. Over time, with experience and as training progresses. Everyone can already increase Team Work w﻿ith time. S﻿ome ro﻿les are likely to develop it more than others but it can still increase over time regardless. If you have suggestions of where you think the ga﻿me could improve,﻿ detail them in the Feature Requests Forum. Yes but here something must drop so something else will go up...but in reality players with age not all but most play better due to experience change of character etc and they don't become worse in technical or physical for example players like in 26-30 y.o. Can a Mezzala play on the same side as an Insider Forward? To my understanding they both look to play in said half space, which would counter-productive, right? Depends on their mentals. Watch the match and see if they stand around holding hands or occupy the spaces you want. In FM18 and earlier what happens if i leave a player's "Position/Role" training on default so it only says something like "M(C) - Playing position"? Does that player still train on a midfielders training schedule just without a focus on a certain role or does he only focus on the additional focus? What happens if i don't set an additional focus? I always used to leave it on default if i wanted a player to train only a single attribute but i'm unsure if that's really how it works. I'm conceeding a quite concerning amount of goals in this way: corner against, opposition player puts the ball outside the box instead of actually crossing and one of their players advances with the ball on his feet without ANY marking or pressing from my team, until he shoots to a helpless goalkeeper. I thought that, by placing two players on the edge of the area, they would counter this move. But they don't. They literally stay both there, just like in the graphic, almost hugging each other. And when the ball is shooted to the edge of the box, the opposition player gets it, advance without opposition and those two guys, instead of chasing him, start running back. No one presses the guy shooting, it's enervating how they give him all the space and time to do whatever he wants, I'm almost screaming to the screen, don't let the guy shoot Christ almighty!!... Then the guy shoots and unless he is really bad at it, it's not much different than a penalty, a shot without any opposition except of the poor GK. So, any ideas to fix it? How can I specifically counter those types of corners? Can scouts occasionally misjudge a player's personality? I have attribute masking switched off on my Freiburg save which removes error on attributes, but I "splashed out" (£5.5m is a lot for me on this save) on a Brøndby IF newgen LB who was rated as Model Citizen yet once he signed he's instead listed as Fairly Sporting. Of course. If they scout a player one time they're not going to know his hidden personality atts. Even watching for a month won't mean they know him inside out. Yeah makes sense, and that's what I assumed. I've just never seen it before, and he was on my shortlist for about a year, scouted at least 5 times before the transfer. Because DM is not a defender (but midfielder), I guess. From my experience you need a player to be at least accomplished (darker green, the level before natural) in the DC position before he can learn the BBOOD trait. Tries To Play Way Out Of Trouble appears to be mentoring-only, just like in the past I believe it was tutoring-only. I've seen players pick it up - for example Frenkie de Jong got it from Lasse Schöne, which then had me worried he also pick up his negative trait. can two btb work well together? Any tips for keeping it tight, while reducing the effect on player condition for the last 20mins of game etc... i'm finding players knackered but wanna shut out a game. Regroup as opposed to counter pressing. Just get back into your defensive shape before you look to try and win the ball back again. You can also drop your defensive line and LOE too should you wish to close the space in behind your defence but this obviously brings a risk in terms of allowing them to build play closer to your goal before you go to engage them. Does offside trap mean more high defensive line? And disabled OffTrap means more deep defensive line? Or these options dont linked? The Trait doesn't actually develop their weaker foot. It gives them the ability to develop their weaker foot. So once they have learned the Trait only at that point do they actually start to develop their weaker foot, hence the message you are seeing. As a side note, players cannot develop their weaker foot past "Reasonable", so always check their footedness before you start . You can of course find exceptions - pick a 4141, use a very attacking mentality with a winger on attack and a player without much work rate and he may not track back all that much, but essentially yes your formation is your basic defensive shape. 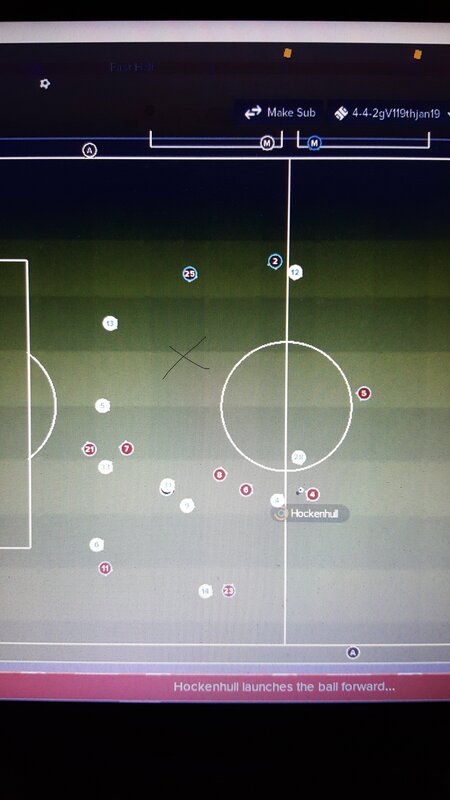 Also bear in mind tactical instructions can help determine where you defend. So your 4141 will always be a 4141 formation when defending, but set up with a low block with little pressing and your 4141 will defend deep; whereas set up your 4141 in a more aggressive way and that same formation will defend much higher up the pitch. So in both cases your defensive shape is a 4141, it'll just be positioned differently on the pitch. Cheers, that’s what I thought. What I’m trying to do is create and the. Use the space more effectively, especially against defensive teams. So, starting a little deeper but using PI to make them an Inside Foreward in the attacking phase. My stupid question is quite long, i'll try my best to explain. 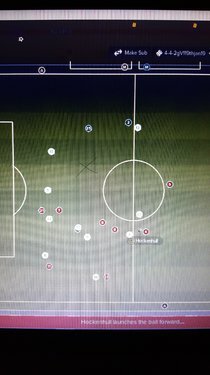 I've played FM for years but not a consistent basis. How do you all know, how to approach a match, e.g If you're managing Mainz at home to FC Bayern, I usually just stick to my own formation/instructions and play it out and rarely change anything. Even away from home, i'd usually keep it the same but i'd perhaps only change from positive to maybe balanced/cautious. I feel like if i went cautious, played deeper and be more disciplined and maybe move my formation about, it could cost me the game anyway where if i kept my usual, it could get me a result (Perhaps Bayern not the best choice but hope you understand what i'm meaning). Do you have no player/team instructions pre game till you enter before the game and see opposition line up? I'm going to add opposition formation towards the 2D Classic so i see if they change formation during game, is it easy to sell for example if they have a LM/LW and they've got him on attack? My final question is, how do you all know what to do, to change a game, it sounds silly asking this. I have mine on 2D Classic and conservative highlights (Could be wrong name). I always seem to play on the same formation 4231 or 41221 and then my team/player instructions always the same. I love FM and i'd love to get much better at the game so going a "smaller" club in a decent league i can maybe achieve something. Is this just the way things are always going to be, or have I been missing something somewhere in responsibilities? I've had this problem since FM16, just never occurred to ask about it. 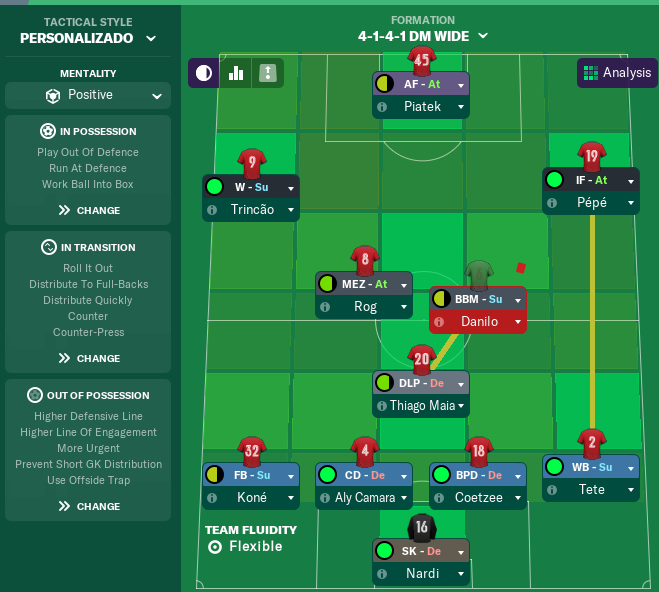 I’m trying to create a tactic which is similar to Simeone’s 4-4-2 at Atletico Madrid. In my head and from what I’ve read they seem to set up in a mid block which will press high up the pitch with the two strikers to try and regain possession, but if that press is beaten they drop back to their mid block and try and win the ball back in midfield through coordinated pressing traps. I was just looking for some advice on how to set up the defensive line and line of engagement to achieve this. My initial thoughts were perhaps a balanced or cautious mentality with a standard or higher defensive line and then perhaps a lower line of engagement. The only problem I see with a lower LOE is the front two being too passive. I’m basing most of this replication on how they set up in the 2018 Europa league final, mainly because the game is readily available on YouTube to rewatch and there’s a good analysis of the match on spielverlagerung. If I was looking to replicate Atletico's 442 tactic under Simeone, I would in the first place pick either Atletico or a team that is very similar to them in terms of quality and player types, because for any tactic to work - you need suitable players (otherwise, the attempt of replication is likely to fail). Now, on your question regarding instructions. If we speak solely about mentality and out-of-possession instructions, I would start with Balanced, standard DL, lower LOE, tighter marking and get stuck in (ocassionally more urgent pressing, but not necessarily and not always). However, defending - like attacking - consists of much more than just that. The setup of roles and duties, plus appropriate player instructions, are no less important. Thanks for taking the time for such a detailed response, i was undecided on whether to include tighter marking as a team instruction or just to select certain players but i'll try it out and see how it works out. Thanks again for the help. My preference in this case would be to use TM as a TI, but also tell the 4 midfielders to mark tighter in their PIs, in order to put some more pressure on the opposition during their build-up phase. Why does the game have a pre-set tactic called "Direct Counter-Attack" which uses a cautious mentality and 4 support duty players, and then the pre-match advice tells you that 1-2 support duties is most sensible for a cautious mentality? Btw, cautious mentality can be used for different kinds of tactic, not only the direct counter preset one. Well I have had played for 2 season now. Generally there's thing that annoy me. Near the end of season, either march or april, my player is somehow decline. Not the attributes but on the pitch performance. So it's like they can't score penalty (either goes wide or straight to the keeper), short passing straight at enemy, despite usual good passer, poor finishing (one on one straight to the keeper), quick defender outpaced by slow target man, or defender just let opposition to walk past him, some own goal, etc. Coincidentally, between September-November my team perform very well. That my underdog team somehow challenging for champions league spot and title next season. In my second season I tried to modify tactic during may, like lowering defensive line, put additional striker as winger and attacking midfielder to increase finishing ability, or put more playmaker esque player but no avail. Does changing mentality only, all other things remaining the same, adjust the team's play significantly? If I change it to cautious without changing any TIs or PIs/roles, can I expect my 'higher' defensive lines to drop somewhat in accordance with cautious? While still being high relative to cautious. Will passing length shorten and temp decrease? Just trying to wrap my head around what happens by messing around with team mentality. If I change it to cautious without changing any TIs or PIs/roles, can I expect my 'higher' defensive lines to drop somewhat in accordance with cautious? While still being high relative to cautious. Yes. Mentality affects all other settings. Tempo will decrease. Passing will not basically change in terms of length, but on a lower mentality players will be less willing to play forward passes in general, so what changes here is direction of passes. What will encourage players to move the ball forward with some more urgency is a higher tempo.